Full Face mask with reverse edge seals, five point harness and impact resistant, Polycarbonate visor. The Grey rubber version has greater elasticity, cut and abrasion resistance and much higher mechanical strength. Its elastomeric properties are maintained across a greater temperature range, too but both test satisfactorily in the range minus 20 to plus 60 degrees Celsius. The Yellow version has greater resistance to perishing, generally better chemical resistance and is easy to clean from grease, oils and solvents. The inherent mechanical weakness, of all Silicone rubber masks, means that it is more prone to head-harnesses and buckle points tearing. Both are fitted with PVC neck straps, by the way and, although the masks are nominally the same size; made from common tools; there is slightly greater 'off-tool' shrinkage, with the silicone rubber and, therefore, the yellow mask tends to effect better fit on subjects with small, or slim faces. Both Sari masks incorporate spectacle mounts, in the mask moulding and parts are easily replaced, when necessary. 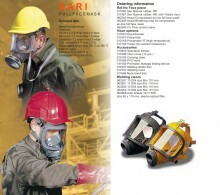 Treated properly, in industrial environments, these masks should last between five and ten years. Your decision as to which type, will usually be thus based on whether you need the chemical resistance offered by the yellow mask. If not, choose the Grey one. The selection of an appropriate respirator mask requires appraisal of the work-place challenges and of the workers' physical and psychological suitability for using RPE. Currently, Regulations in the UK demand that prospective users of all Respiratory Protective Equipment (RPE) be 'Fit-tested' by a competent examiner, using a suitable method for this audit. If you need help in such determinations, please use the web site's 'contact panel', so that we may assist you, right through Risk Assessment and Fit-testing to your RPE management programme and audits. We provide a complete range of CE approved particle, gas and combined filters, to suit. And, of course, we provide simple audit forms, for your maintenance record. Click the button below to add the Kemira SARI full face mask, Yellow, Silicone rubber to your wish list.